Join Marja Vongerichten as she rediscovers her Korean roots and introduces her superchef husband to the tastes and flavors of Korea. (New York, New York, April 2011) Korean food isn't shy. It's about loud, punchy flavors, about ingredients that take time to pickle and ferment, about soups that come together quickly with a rolling boil and barbeque cooked over an open fire built right into the dinner table. It's about banchan, the huge variety of side dishes that accompany every Korean meal, and also about communal eating. It's about sharing food and time with family, about a culture that's simultaneously rooted in tradition and devoted to innovation. Korean food is healthy, satisfying and it's entirely fun. Join Marja Vongerichten on KIMCHI CHRONICLES-part travelogue, part food fantasy and part documentary of self-discovery-as she explores and celebrates a cuisine and a culture committed to the age-old practice of taking something ordinary and making it extraordinary. Marja's remarkable life story will be told throughout the series. Born on the outskirts of Seoul to a Korean mother and an American GI, Marja was put up for adoption at three and then was lovingly raised in northern Virginia. When she was 19 she reconnected with her birth mother, who had relocated to Brooklyn. In reuniting with her Korean family and taking trips to Korea, Marja's life has come full circle. On KIMCHI CHRONICLES, viewers will get to see the country through Marja's incredible and completely distinct lens. In each episode, she will take you to Korea along with Jean-Georges and their daughter Chloe and other friends like renowned actress Heather Graham. Marja will go straight to the source to find the best of Korea from the rolling hills of green tea on Jeju Island to a tiny stall in a sprawling market that serves the most crispy, savory, completely addictive pancakes known as bindaeddeok made from mung beans ground just before they hit the pan. Then Marja and Jean-Georges will invite you back to their kitchen in New York, along with actor Hugh Jackman and his wife Deb, their real life neighbors. Together, they will create the dishes they fell in love with in Korea and Jean-Georges, a true culinary icon and veritable genius, will also prepare new dishes inspired by the Korean pantry coupled with his command of simple, flavorful and delicious combinations. It's worth noting that Marja holds her own in the home kitchen of one of the world's most renowned chefs and manages to even teach Jean-Georges a thing or two when it comes to gochujang, red pepper paste, and all sorts of other Korean ingredients and family secrets. All of the accessible recipes will be in the THE KIMCHI CHRONICLES COOKBOOK and through www.kimchichronicles.tv. KIMCHI CHRONICLES will be available for early release for New York City in May and will launch nationwide in summer, coinciding with the release of THE KIMCHI CHRONICLES COOKBOOK. Taking pubic television viewers on a scenic, food-oriented tour of Korea and then translating everything into simple, approachable recipes, Marja and Jean-Georges invite you to celebrate the richness of the Korean table with them on KIMCHI CHRONICLES. 13 high-definition episodes from Frappé, a six-time James Beard Foundation Award winner and leader in food and travel programming responsible for shows like Spain...on the road Again, The Best Recipes in the World, Barbeque University, Dessert Circus, Jewish Cooking, Chez Pépin and The Apprentice, Madeleine Cooks, Food As Medicine, Chile's Food and Wine and Pierre Franey's Cooking in France, and more. 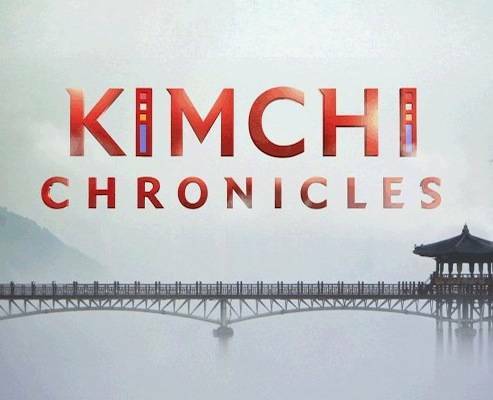 KIMCHI CHRONICLES is presented by American Public Television. Visit www.kimchichronicles.tv for full episodes, bonus materials and recipes, ingredients, books, DVDs, KC Blog and YouTube. Also stay tuned by following the series on Facebook, www.facebook.com/KimchiChronicles and on Twitter, twitter.com/kimchitv. Episodes will also be available for download on iTunes (and the first is free!). THE KIMCHI CHRONICLES COOKBOOK from Rodale features gorgeous full-color photography and recipes adapted for the American home kitchen. KIMCHI CHRONICLES is made possible by Visit Korea Year Committee, Korean Food Foundation, Ministry for Food, Agriculture, Forestry and Fisheries, Ministry of Culture, Sports and Tourism, Samsung Home Appliance and Hmart. Additional support by Hite Jinro Group, CJ, Westin Chosun Hotels, Korean Air, Amore Pacific, Yido Pottery, Le Creuset, All-Clad, Cuisinart and John Boos. [Spoiler] Added episode 10 captures for the Korean drama "The Greatest Love"
[Spoiler] Added episode 8 captures for the Korean drama "Romance Town"